With the origins and provenance of food stuffs being very much in focus in recent month's it is fascinating (at at times alarming ) to look back at the misdemeanour's carried out by past generations in relation to beer production. The brewing industry of the past, had, like any other food manufacturer its fair share of skulduggery! So what lay behind their motives, and just how dangerous was it? Often the most base of human traits was as the root of such actions, the desire to increase profits by deception and adulteration. 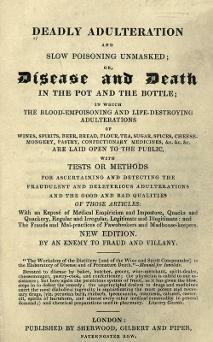 The most common form of adulteration was simply to 'stretch' a brew. Adding water to a completed beer in barrel, was, if done carefully, not always easy to detect from the consumers point of view. The danger here from the criminality viewpoint was not to let the action appear to obvious. Subtle changes to strength were not always detectable, but reducing a beers strength drastically for the sake of volume would naturally run a far greater risk of detection. During the brewing process itself different strength beers can be produced by adding water to the 'wort' ( the malt extraction) to make different brands. This is known as a 'Parti -gyle' and is perfectly legal and practised by many brewers globally. Tampering with the finished product however by adding water is not, and is still the most easy form of fraud. So serious, and prevalent, was this crime in Medieval Times that in 1377 a new post of 'Ale Connor' was introduced as a deterrent to such behaviour. He was responsible, by law, to evaluate the quality and price charged by brewers. If water was used to increase beer volume, the criminal mind would also then turn its thoughts as to how to induce the customer to drink more! The solution lay in the addition of 'salt' to the brew, which was believed to produce a craving and ready thirst! This type of adulteration was the source of constant claim and counter claim between government and brewer during the 19th Century and was known as 'Bobbing' and particularly despised. Whilst the fundamental elements of beer are water, yeast, malt and hops, unscrupulous brewers often looked at alternatives to the latter. This was often due to the price of the raw materials, with wild fluctuations in malt, and especially hops prices annually during the 19th Century. It was the large scale brewers with their financial resources who could weather these storms more so than the smaller concerns, which is where the adulteration was more prevalent. This said however, the larger breweries were never fully exempt from such behaviour, if the situation demanded it! It was the brewers druggist therefore who they turned too in the 19th century who begun to play a more ominous role in the production of beer. Finding an alternative ingredient to hops to inject bitterness was one objective, but this could leave flavours of tartness, sharpness, and astringency that made the brews mouth puckering and highly unpleasant. For a replacement to malt a different function was called for. One was to give the beers an impression of 'age' and 'maturity' the other (more ominously) to artificially increase the intoxicating effects! The choice of such adulterants is astonishing and alarming by today's standards, and was extremely varied encompassing many plants with different, as they saw it "attributes". The lists below are a sample of these many adulterants. The first list is of those that were considered noxious (or mind bending) to say the least - the second the adulterants that held far graver consequences! ALOES. (Aloe Vera) also went under the name of Sea - houseleek or Sea - ay - green. It was the variety from the Island of Socotra that was considered the best by brewers as a hop substiute. So bitter however it's astringency was almost undrinkable. WILD CARROT. With overtones of peach and apricot flavours became a popular addition to the mash tun in both the 18th and 19th centuries when hop prices rose too high. Bitter, but at least tolerable. YARROW. A hop substitute that added a spicy aroma to beer and originated from North America and Asia. In high proportions its toxicity could cause dizziness, bell like ringing in the ears, and was even said the onset of madness. BELLADONNA. 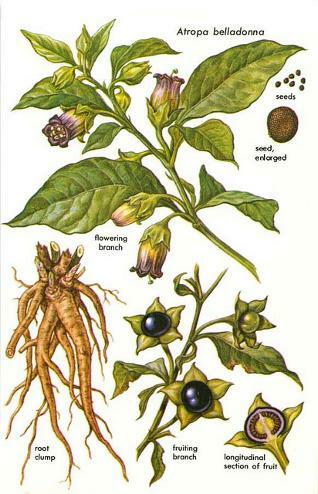 Deadly nightshade was used as a hop substitute during the 19th century and its notoriety was well known. Highly poisonous containing the alkaloid atropine. BITTER BEAN. Hailing from the Philippines and related to NUX VOMICA this hop substitute was considered to be more expensive, but no less lethal. Contains strychnine. CHERRY LAUREL. Originating in Asia Minor this hop substitute (like others here) begun to take things to another level! With an aroma of hydro cyanic acid it was considered a dangerous substitute - and poisonous. COCCULUS INDICUS. Subject to more indictment in the 19th century than any other adulterant Indian or Fish berry is an extremely poisonous narcotic. Was widely used in porter and stout production. Can stupefy, and in high enough quantities prove fatal. FOXGLOVE. Digitalis was once again used as a hop substitute which could bring on nausea and severe stomach pain. Would also give an impression of high intoxication, which could lead to death. WHITE POPPY. Opium was used to to make beers appear more intoxicating also during the 19th century. A powerful narcotic and highly poisonous, its reputation today is well understood!